How much longer will such scenes be part of Rajasthan’s landscape? 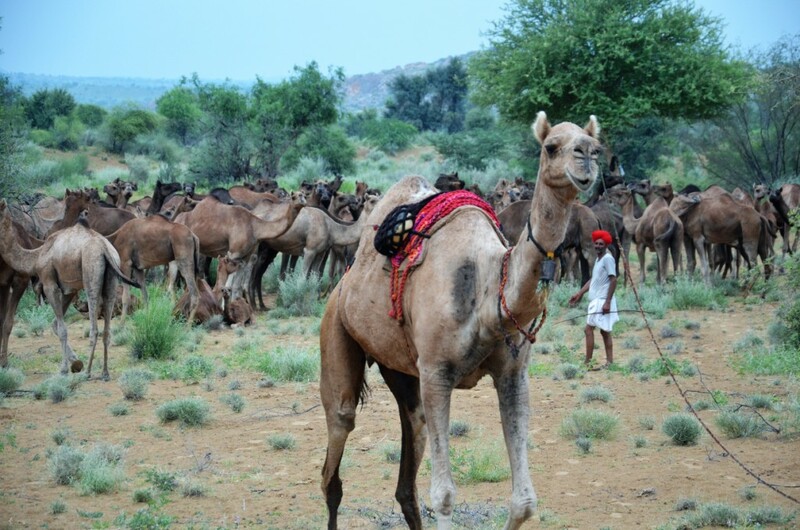 Rajasthan’s camel breeding communities – representing various castes, incuding Raika, Rajput, Muslim, Bishnoi, Jat, and others – presented their Biocultural Community Protocol to H.H. Maharaja of Jodhpur and to two of Rajasthan’s ministers during the Marwar Camel Culture Festival on 5th November, 2017. In addition, they released a suggested draft Rajasthan draft state policy on camel conservation 21 October 2017 that cuts across all relevant government departments, including animal husbandry, forests, rural development and tourism. Unless some strong action is taken, the camel in Rajasthan is doomed, despite global demand for camel milk rising steeply and providing significat income opportunities for poor people in rural areas, as seen with the Kumbhalgarh Camel Dairy, India’s first micro-camel dairy located on the campus of LPP’s partner organization Lokhit Pashu-Palak Sansthan.